To Be Rich like John Chow! I wonder how it feels to be in John Chow's shoes. Only the most famous blogger around, JC makes big bucks off his blogs and enjoys a rewarding life of working from home while earning huge amounts of money. I can imagine the initial hardship he endured and all the effort he put into being this huge of a success today and it's just so inspiring, to me at least. I bet JC doesn't have to worry about money like me. If he feels like going on a vacation, he can do so whenever he feels the urge! If JC feels like buying a car, he can happily purchase one in the wink of an eye. No need to worry about where his next meal is coming from if he decides to splurge on a new jeep or a Toyota for instance. 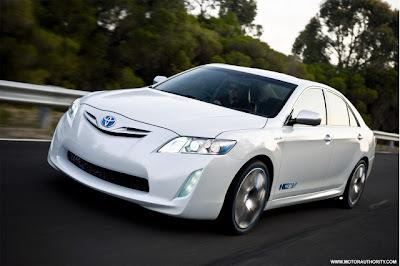 Speaking of cars, have you seen the new Toyota Camry Hybrid? I recently wrote a review on the Prius at my cat blog. I thought that car was already pretty cool but now that I've seen car photos of the new Camry, I think this model is superb too! The 2009 Toyota Camry Hybrid offers a higher level of luxury and comfort. Staying true to its quality-built representation, the Camry Hybrid easily seats five occupants comfortably. Cloth seats are standard but leather is optional for those seeking class and even more comfort. Style-wise, the 2009 Toyota Camry Hybrid is pleasing. Not as sleek or daring as the Prius, it is nonetheless eye-pleasing and appeals to many types of buyers especially if comfort, class and reliability are what you're in the market for. Are you thinking of buying a new car? Which model are you considering? :* :* :* :* Ane! =-O =-O =-O Monica! FC2! Ooh! yay for BV! Haven't had one from them in a while..
Hehe I think so too Mon! SS always gives PBs to MPG and not WOAFS! I haven applied MD for SS yet though…. How abt LW Ane?? Have u set ur rates for the text link ads?? Oh I have 6 to chop now Ane, but I don like the topics and some of them are the teeny weeny PBs, which we’ve just discussed at TF so no thank you ha ha! Recent blog:=- Happy Birthday Kor Kor! thinking of getting a new car? I saw that camry too, yes it's a beauty but I like suv types or big cars =) is it too much for a small girl like me? Hi Ayie! U planning to get a new car? Oh perhaps something smaller for u then sweetie so u won feel so small in that huge car, would it be easier to handle something smaller too? oh my all of you night owls...I remember those days! Congrats to your Fc'S. I don't think I will ever make it!! oh boy wouldn't I love that new car? i'm sure everyone wants to be rich!